“Did you wash your hands?” If you are a caregiver for young children, you’ve probably asked this question more times than you can count. Handwashing is an essential life skill that all children must learn. However, it is more than just a convention or self-care. Teaching your toddler handwashing can protect her and others from illness. Today we will look at why handwashing is important, how to wash hands well, and tips and tricks to help your toddler learn. Handwashing is an important defense against the germs and bacteria that can cause illness or infection. This is especially true for small children who frequently touch their faces. And as you have probably experienced, a small child often becomes a gateway for illness for the whole family. Handwashing has been shown to be an effective and important protection against common illnesses such as colds or the flu. However, it is equally effective against more serious diseases like meningitis, hepatitis A, and respiratory syncytial virus (RSV). While the importance of handwashing is not recent news, a surprising number of adults still do not prioritize this form of hygiene. By teaching your toddler handwashing at a young age, you help him form a habit that will serve him for the rest of his life. The most common time that most people wash their hands is after using the restroom. This coincides well with a toddler’s life since potty training offers an opportunity to teach two important skills at once. There are additional times throughout the day when handwashing is prudent. Handwashing prior to eating or preparing food is wise as eating and drinking with dirty hands can cause contamination. This is especially true for young children who do not always use utensils. Another important opportunity for handwashing is after using public or shared toys or equipment. This might mean you help your toddler wash her hands after playdates, a visit to the library, or the grocery store. Obviously, time spent around anyone with a contagious illness requires handwashing, as does time spent touching animals. 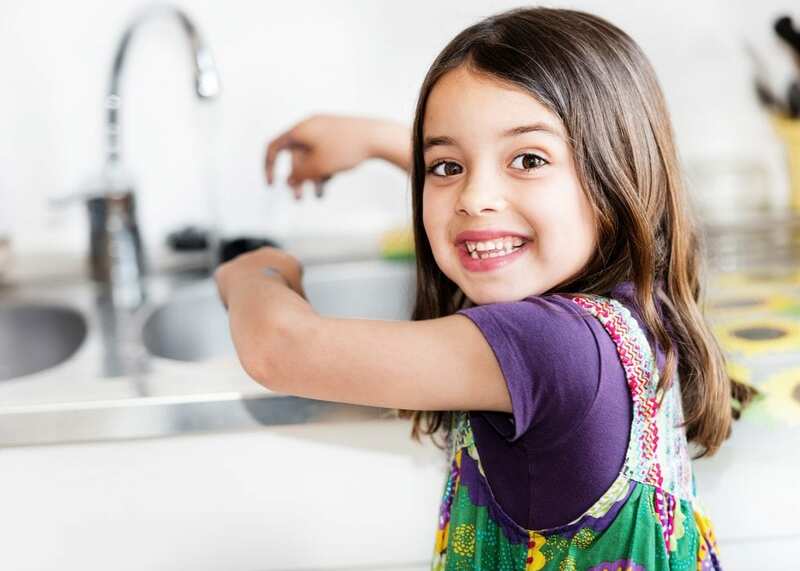 By being mindful of your child’s exposure to germs and proactively encouraging handwashing, you can reduce your child’s vulnerability to illness dramatically. If you’ve ever watched a toddler wash his or her own hands, you know that they are typically not very thorough. Much like toothbrushing, toddler handwashing is a skill that should be supervised and regularly taught until your child is older. To teach your child proper handwashing technique, wash your own hands at the same time. Use warm water and soap to lather your hands for at least 20 seconds. This may be longer than you expect, so use this time to practice counting or sing a song. Also, encourage your child to get all the parts of their hands and wrist well-lathered. Many children simply rub their palms together, missing the backs of their hands and nails entirely. Once the hands are well-lathered, rinse completely and dry them on a clean towel. Making this process a regular part of your routine will instill healthy habits for your whole family. Many children are unable to reach the bathroom sink without assistance, so families often choose to keep a step stool available for young children to use. This allows children supervised independence as they practice handwashing. If you choose to keep a step stool in the bathroom, be aware of any chemicals, medications, or other dangerous items that it puts in your child’s reach. For your child’s safety, you may choose to bring the step stool out for handwashing and store it elsewhere at other times. The ideas of germs, sickness, and hygiene may be difficult for your child to grasp. After all, children learn through interacting with their surroundings, and harmful viruses and bacteria aren’t exactly available for show and tell. To help your child understand why handwashing is important, speak to them regularly about the ways microscopic organisms affect their lives. For instance, explain to them how helpful bacteria change milk into yogurt and cheese. When they do get sick, describe the way their body fights dangerous germs and helps them get strong again. You can find books about germs and hygiene at the library to read together. When you are actually washing your hands, find a song that you can sing together to make sure you are washing long enough. Pick a reminder phrase to repeat that jogs your child’s memory about the steps of handwashing, such as “front, back, and around your nails.” More than anything, set an example of regular handwashing, and your child will follow your lead. The World Health Organization (WHO) includes handwashing instruction in many of their major interventions around the world because of its potential life-saving effects. When you teach your toddler handwashing, you are protecting him from illness as well as helping him learn to protect others. Are you looking for childcare that will partner with you in teaching toddler handwashing and other essential life skills? Consider Legacy Academy. Call or visit one of our centers to learn more.